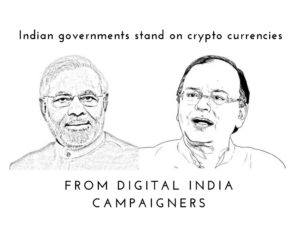 A lot has been discussed regarding the Indian governments stand on crypto currencies. It’s obvious that all those dealing with and using crypto as businesses will be awaiting a clear answer on this. Not only does this interest Indians all over the world but people of other nations too. India has been noticed as a quickly developing country over the past decade. It’s been taking giant leaps in the fields of economy finance space exploration science education healthcare etc. The world is bound to be interested in this part as well. Block-chain technology is being recognized as a turning point in tech development and everyone wants to be part of the change. Several top IT companies in India are exploring the uses of block-chain and trying to apply it to existing processes so as to save time, money and effort. The governments of India, both past and present have recognized this and are encouraging research both in the public and private sectors. When it comes to crypto currency though….they seem to be holding back. While this may enrage all us crypto lovers we must try and understand the probable reasons for this. Lack of knowledge seems to be one of the main driving factors. While the government has been looking into crypto since 2012 they haven’t been that bothered until recently. They probably did not expect the country to get that tech savvy this soon and probably thought they had the luxury of time. Also until last year crypto was hardly noticed. This could be attributed to the fact that the country and population wasn’t that connected. The digital India campaign of the current govt. has managed to do that. Indians now have easier, cheaper, faster access to the internet than ever before. And when the value of BTC increased they want to know why they don’t have a slice of that pie. Another probable reason for the governments hesitation is possibly the fear of increased cyber crime. Last year’s hacking scam and credit card fraud with criminals asking for remuneration in Bitcoin has probably shaken up law enforcement agencies across the globe. Little do they understand that due to the block-chains ability of recording every transaction and it’s high traceability, it is much easier to catch such cyber criminals. It is however the government’s job to protect the general public. They will have to create laws to ensure that those choosing to invest, transact or trade with this asset just like any other. We should however give credit where it is due. While the media has been very vocal about their own version of what the government says…i.e. “Bitcoin is illegal”, if we pay careful attention we may be able to see that tiny ray of hope. The government does say that said Bitcoin or other crypto currencies are not legal tender for payments and settlements. This basically means that the government or law will not extend protection if you had any dispute. If we listen to the governments stand clearly we will understand that the government sees Cryptocurrency as a form of an asset or trading, like gold, silver, bonds stocks etc which holds value . The Indian Income Tax department is clear on collecting capital gains tax and trading tax accordingly. Even in the past the Indian government and the RBI have issued similar statements regarding dealing with Cryptocurrency including Bitcoin, alerting users to deal on their own understanding, invest only what they can afford to lose and do a detailed research before investing, since they have a economic and financial risk associated with them. The Indian government seems to have decided to keep an open mind about Cryptocurrency. Mr Jaitley also mentioned that the government is already exploring the use of block-chain technology and Cryptocurrency and Bitcoin and an expert team is being setup to monitor and regulate them soon. 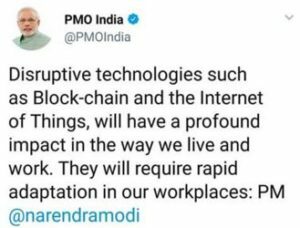 So Indian crypto- crazies need not be too worried about the future of crypto in India cos its bright and now Mr Modi also has a say after his detailed understanding that its disruptive and he wants rapid adaptation in our workplaces.